Now before you even begin to read this, you have to know that I am not a personal trainer and not trained in any way in fitness and health. I am however, a mother to three children who once had a nice flat tummy. It’s been 3 years since my youngest was born, I am still struggling to get rid of the pouch of a tummy I am left with. I do have friends who are fitness fundis and they have assured me that the plank is a great way to get my core back in shape after the thrill of enduring 3 Caesarean sections in 5 years. So I thought you’d like to join me in trying to find a waistline again. I have used the information from these friends and made a beginner level challenge for mothers everywhere who are longing to once again see their abdominal muscles! The plank is one of the best exercises to strengthen your core, and this does not refer solely to your abdominal muscles. The core is a complex series of muscles that includes your entire body, minus your legs, head and arms. What I like most about the plank is that it is 100 percent excuse free. It requires no equipment, machines or special apparel. All you need is a little motivation, direction and structure to reach your goal. Ideally you should build your plank time by around at least 10 seconds each day during this challenge. I have varied the days and repeated some of the days when the jump has been longer than 10 seconds from day to day. So you may find you are repeating the same times for consecutive days. To make things easier, I have created a downloadable printable progressive challenge chart to follow. I have started really focusing on ridding myself excess weight and getting myself healthier and stronger..Surprisingly, even thought I am at home with my children, I find it very difficult to find time to exercise. I decided that I would break down my exercises into small, bite-sized chunks that I could manage on a daily basis without having to carve out a huge chunk of my day. 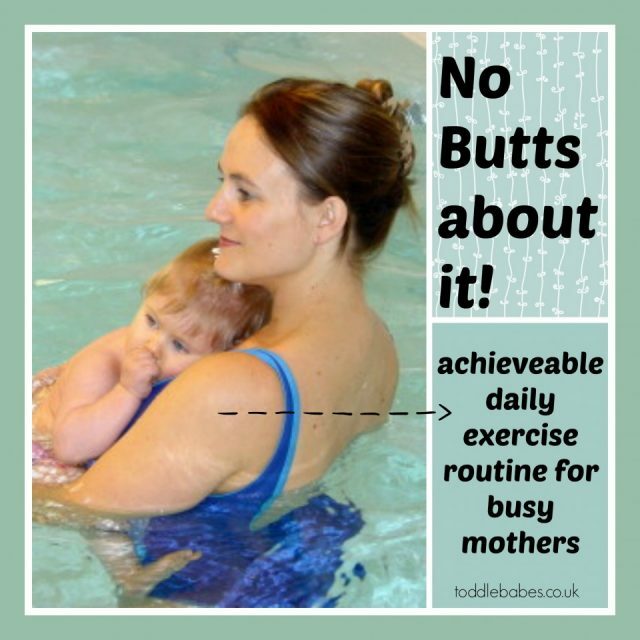 Here is my exercise plan for busy mums. With this in mind I have planned a daily exercise routine including running (long distance and sprints), elliptical trainer sessions, exercise DVDs, free weights and anything else that grabs my fancy. I recently came across this squat challenge and created my own plank challenge and thought it may be a good to do these activities daily to compliment my routine. 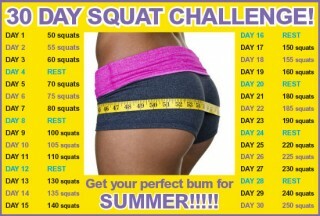 The plank challenge can be downloaded for printing, just click on it. I do hope that this exercise plan is helpful for all the busy mother’s out there who , like me, are tired of the excess baggage caused by pregnancy. 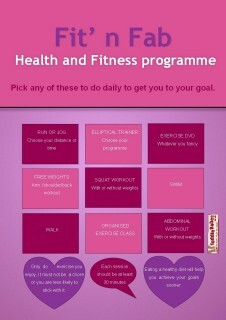 And I hope too, that you are able to fir in a few of these exercises each week. *I am not a health professional, please consult a doctor or physical trainer before starting any type of exercises. 1. Stand tall and position your feet hip-width apart. 2. Slowly lower down to the floor in a squat position until your thighs are parallel to the floor, or until your knees start to come over your toes – try to keep your tummy pulled in to protect your lower back. 3. Return to standing and repeat.